Today we will show you a trick about Firewall name How To Add Firewall In Android Device. Firewall is the security in any operating system that disallows all the dangerous IP’s and also the harmful programs to penetrates in the operating system. We all know that windows operating system has already it’s firewall. That’s why we don’t need to download any other firewall for our windows. But remember that our android phone doesn’t have it’s own firewall. That’s why we need to download firewall for the safety reason of our android. In the operating system like Windows, there is the inbuilt feature of Firewall that protects your Windows PC from the security threats. As we say that there is no such feature and that’s why we are here with a cool method that will let you add this Firewall Security feature in any android. 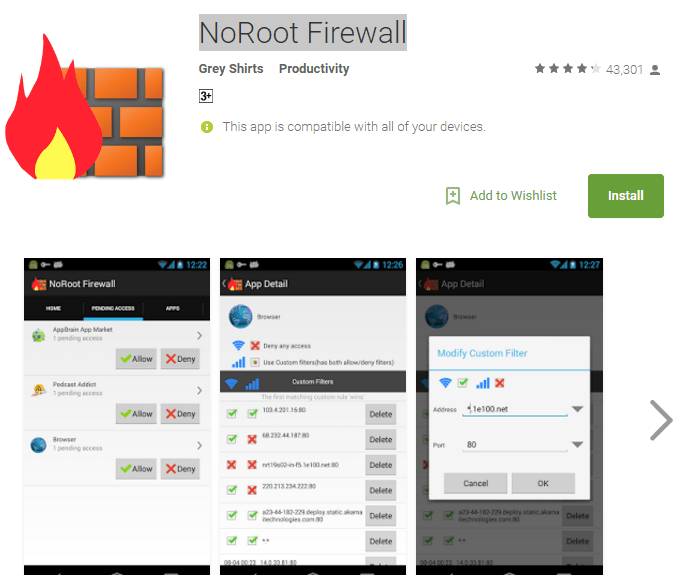 We will show you the easy way to use firewall on android. Through this trick you will able to protect your Android from various security threats. So, let’s know how to do that. Remember one thing for the operation you do not need to root your phone. So, there is nothing to worry. You can do the task without any risk. First of all you need to go to google play store. After that search NoRoot Firewall on search bar. You can download the app bu simply click here. Now you need to launch the app after installing it in your device. After that you can see Start icon on your device screen. You just need to click on Start to go ahead. After that it will ask you to allow the connection. Just simply tap on Ok to process. After that it will through you on Home tab. You just need to go Pending Access tab by selecting the tab. Now there you will see all the apps that require connecting to the internet. Now you can do here anything you want. You can allow them or deny them as per your wish. Now you are done. Firewall is like a security guard. It will protect your device from various types of threats. Now don’t worry about your device cause now your Android has a Firewall that will be securing your device from various threats. Hope you like it. Stay with us to get more.